Longer, lower and heavier — as are all the new Big M’s — this spirited beauty steps out with all the litheness and cat-footed confidence of a prancing panther. Two-toned top operates at a button-touch to give you either open-air expansiveness or a snug, closed-top haven. This beauty packs a punch, too, with an advanced new V-8 . . .
An illustrati0n of the Monterey Convertible Phaeton in Flo-Toned Desert Tan and Classic White from the 1957 Mercury sales brochure. We would venture to say that no car before or since has had the litheness and cat-footed confidence of a prancing panther. With a new, clean-cut look . . . longer, lower and wider . . . It’s difficult in one sweep of the eye to drink in all the beauty and brawn of this Montclair Phaeton Sedan. Trim lines declare its yen for highway action. A slim, low-silhouette roof seems to float above the broad expanse of glass on all sides, with no center pillars to mar your view. Climb aboard this world of luxury, and see how much fun driving can be . . .
Here’s a vehicle with excitement and thrills written in every sweeping line — right from the mass and gleam of its new Jet-Flo bumpers clear back to the new sculptured side projectiles that top a long, low rear fender line. Interiors are a veritable throne room of sovereign luxury. Beneath that broad hood hums a V-8 with more zip and reserve power than any other in Mercury history . . . This week’s batch of crate art includes a yummy Yam Bowl as well as a Western Hoe. De Soto’s Flight-Swept styling is now more advanced than ever with its striking new grille, brilliant exterior trims, custom tailored interior and dramatic new colors. The Diplomat for ’58 is your introduction to an exciting world of carefree motoring . . . The 1958 DeSoto Diplomat, a badge-engineered car sold outside the United States, had a Plymouth rear end and, like the low-end Firesweep series, Dodge front fenders mated to a DeSoto grille. 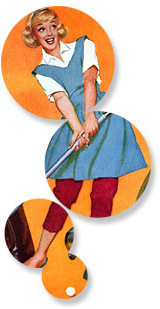 This 1953 illustration, by David Lockhart for the November page of a 1954 gas station calendar, provides 100 percent of the FDA’s recommended daily schmaltz allowance. The Eldorado made its debut as a 1953 model, with chopped body, first-ever wraparound windshield, Kelsey-Hayes wire wheels and a $7,000 price tag. The 1955 Chryslers, among the first of the “Forward Look” cars styled by Virgil Exner, were a dramatic departure from the boxy shapes that characterized the company’s postwar vehicles. This example was photographed sometime in 1954. From 1953, a taste of Yule from illustrator Al Brule. Who evidently had a thing for Christmas lights. Now if someone would please pass the cranberry sauce . . .
Another Sunday, another batch of crate art. Critters! Kids! Yams! The pause at the drive-in is part of the fun, says this 1957 Coca-Cola ad showing a Mercedes roadster and Chrysler convertible at the marina, illustrated by Bob Peak. 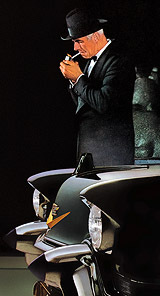 (“Who is Bob Peak?” “Bob Peak is the father of the modern movie poster!”) Excellent, class. You may all leave for recess a minute early. From 1950, the original Crane Criterion Lavatory and the start of designer bathroom fixtures, as well as the oldest prestige plumbing line still in existence. Exactly who the designer was, we’d love to know. The illustrator here is the mysterious F. Porter. Our boy lost his pipe but seems to have a different girl, and different hair. 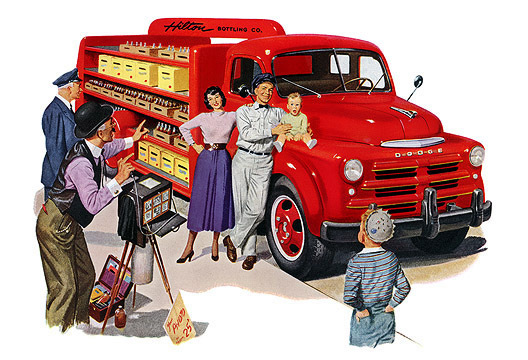 A wonderful illustration from 1952 by Pete Hawley for Jantzen. The earliest reference we can find for this talented artist is a 1939 mention in the New York Times of his winning an Art Directors Club award for a Heinz ad. 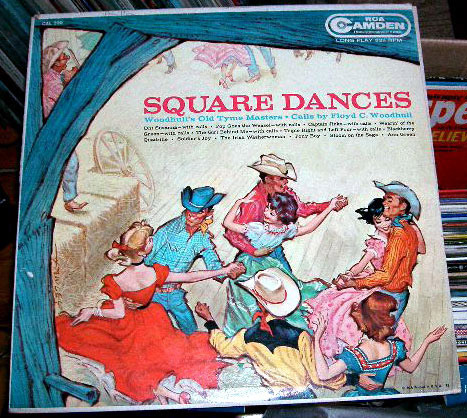 The swimsuit illustrations and occasional pinups went from the 1940s to around 1957, the same year as his American Weekly cover and this LP jacket. In between were orange juice ads. Then came his work for AT&T and the creation of Betsy Bell and her spinoff siblings. And on that kitschy note his career trail runs dry sometime in the 1960s. More about Pete in Leif Peng’s blog here, here and here, and his Flickr photoset. More Plan59 images here.
. . . New Departures. In fact, New Departure ball bearings play an important role in just about every product with moving parts . . .
seen . . . bright and decorative even when unlighted . . . they’re simply dazzling when lit. New Permacote finish won’t chip, peel or fade . . .
Today’s selections come from 1949 and 1950. You can’t get much merrier than this. Elsewhere on the Web, we’ve posted a new batch of crate labels over at Box of Apples. 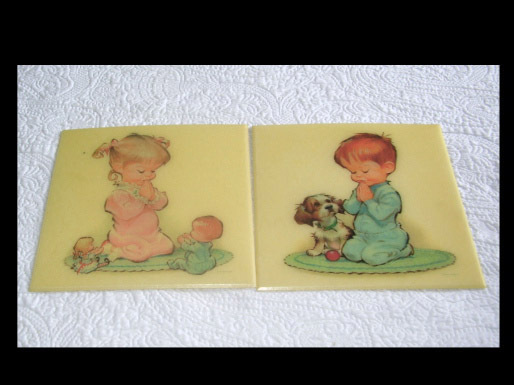 Plus a gallery of vintage bathrooms at a plumbing Web site. We do have to eat, you know. Who needs reindeer when you have the Giant Yellow Christmas Bulb? Taxi! What an after-school snack — when there’s a new Toastmaster “Toast ’n Jam” Set on the table! Amazing, the cheery companionship you share over the crisp golden slices, oozing hot butter, and ladled with a jam or spread. And what a good thing you share when you give this set as a gift! Handsome, hand-rubbed tray of walnut veneer neatly nests two gay colored jars and a toast plate of fine Franciscan Ware — and the famous Toastmaster Toaster. So see your dealer now. Get one of these Toastmaster “Toast ’n Jam” Sets home and get set for the biggest Toast ’n Jam-boree you’ve ever seen! How well we recall coming home after school and peeking round through the back door, a blush of anticipation coloring our hot little faces. Dare we hope — could it really be? Yes — toast! From 1950, a bit of kitchen (and kitschin’) drama from the folks at Toastmaster. The 1950 DeSoto with happy owners illustrated by Constantin Alajalov (1900-1987), an artist perhaps best known for his New Yorker and Saturday Evening Post covers. Yes sir, that’s my baby! Of course, no truck driver loves his truck as much as he loves his child. But let’s not fool ourselves, either. Ask any driver of a Dodge “Job-Rated” truck. He’ll tell you that he takes real pride in his truck! And why shouldn’t he . . .
A beverage carrier from 1949, when soda pop was hauled around in glass bottles in wooden crates on big red trucks, little kids wore Jughead-style beanies and things were generally much better. 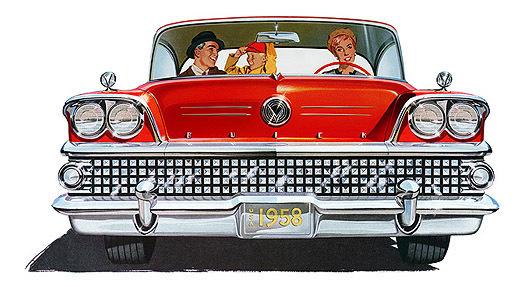 We, and the commercial artists of circa 1950, betray a certain weakness for big red trucks. Here are some more: Santa’s Studebaker, and another red Stude by Frederic Tellander, and a red GMC Diesel from 1948 by Nixon Munson. ≈ Face Transplant Goes Horribly Awry! Kohler Spruce Green has a clear, fresh beauty. Like all Kohler pastel shades it fits into varied decorative effects with individuality and charm. The smooth, lustrous Kohler enamel finish of the Cosmopolitan Bench Bath is glass-hard, easy-to-clean. The Gramercy vitreous china lavatory is typical of the beauty of Kohler design . . . It looks blue to us, but what do we know. The two bathing beauties in this illustration from 1950 seem to be sharing not just a bathroom but a face — one that looks about 10 years older than the bodies underneath. The one on the left is especially alarming/unconvincing. Slayton Underhill (1913-2002), known as “Master of the Hat” by virtue of his paintings for Stetson, was also illustrator of the Viceroy Cigarettes “Man Who Thinks for Himself” as well as a number of Lincoln and Mercury ads (his wife, Barbara, was “The Lincoln Girl”). Here, from 1948, a jaunty chapeau worn by Bing Crosby. Who can tell us if the 1950 Stetson ads were also by Slayton Underhill? The hats themselves are painted in the same style as the one on top of Bing. This fellow looks like he’s up to something. Three men, three hats, no waiting. Soon to be a large-format print. The Cosmopolitan Bench Bath affords a useful seat, a slope end for comfortable bathing, and a flat, safe bottom. The lustrous Kohler enamel is fused to a base of nonflexing iron, cast for rigidity. The Jamestown vitreous china lavatory, with Centra mixer and Synchro mechanical drain, has a large basin and ample shelf space . . . This illustration is from 1950; growing up, we had similar Kohler-equipped bathrooms of 1958 vintage in blue and seafoam green. Something really new has been added to the ever popular Stetson Flagship! This stylish hat — long noted for its youthful verve and dash — now boasts a new, modern “Wafer Edge.” It’s a slim, trim welt edge, triple-stitched, that makes the Flagship look even more streamlined and ready-for-action. Try it on soon. See how it gives you a distinctive, well-dressed look — a look that is so necessary to good taste. Another of Stetson’s 1950 Big Heads, this one in the $12.50 Flagship. Crane’s “Diana” lavatory in vitreous china, illustrated by an F. Porter who may or may not have been the American artist Fairfield Porter (1907-1975). Who needs 20-20 vision to see that this Dynastar Grille is the brightest note in styling since running boards disappeared? And who needs more than 15 minutes at the wheel to come to this firm conclusion: This 1958 Buick — this B-58 Buick born of aviation principles — is the lightest-feeling, the sprightliest-handling, the mellowest-moving car that ever ate out of your hand. Because this big, roomy B-58 Buick — and only the B-58 Buick — gives you Flight Pitch Dynaflow, and a B-12000 engine, and an Air Ride, and a host of other features that make this the first big car that’s light on its feet . . .
Buick's Dynastar Grille, reminiscent of a teenager just back from the orthodontist, was part of a styling package dripping with chrome. And for some reason it makes us hungry for waffles. You probably knew the name of this hat the moment you looked at it. It’s the famous Stetson Open Road, the Western style that has become one of the East’s most popular hats. The rugged individuality of the Open Road is in keeping with the personality of the man who wears it. It’s a distinctive hat for men who are natural leaders. From 1950, one in a series of striking “big head” illustrations for Stetson Hats that we’ll be posting in the coming days. This spring, stripes are sky-high with men who know sound style! Arrow’s new PARK ensemble features shirts with white corded stripes on soft-toned broadcloth in blue, tan, gray and green . . . $3.50 at better stores. This illustration from 1948 shows a handsome young man in something of a pointillist style in front of the Angel of the Waters Fountain at Bethesda Terrace in New York’s Central Park. Over at Adventurelounge, Air Transport Facts from 1934 is a fascinating peek at civil aviation when it was starting to take off, and passengers could keep their shoes on.